In about 1960, the State of Indonesia issued banknotes pictorial rubber tapping, a tapper was tapping rubber trees. This means that during the period that the State considers plantation crops sub sector is very influential on the State's economy. Indeed they do, the State gets money from the estate sector is greater than Pertamina that at that time the State Petroleum Corporation has not produced significant revenue of foreign exchange. At a time of economic crisis, Indonesia experienced in 1997, the plantation sub sector appeared as foreign exchange earner. Estate crops as tea, coffee, quinine, coconut, and sugar cane ,and other. 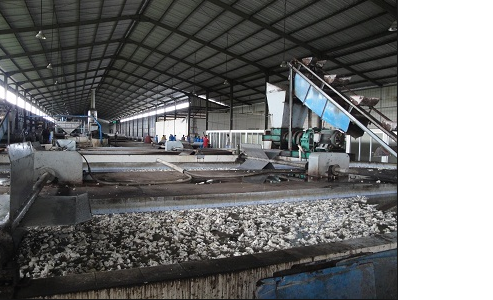 What products are the subject of state income in the plantation subsector, including the other semi-finished products of rubber, in the form of sheet, crep, concentrated latex and rubber crumb (crumb rubber). I here briefly describe the rubber Processing. The main result is the latex from rubber trees that can be sold or traded in the community in the form of fresh latex, slab / coagulation, smoke or crunches / sit-wind. Furthermore, these products will be used as raw material factory Crumb Rubber / Rubber Crumb, that produces a wide range of raw materials for a wide range of downstream industries such as tires, balls, shoes, rubber, gloves, swimsuit, rubber bands, rubber toys, and a variety of other downstream products. The by-product of rubber is rubber wood that can be derived from the garden rehabilitation or rejuvenation of an old rubber plantation that is no longer produce latex. Generally, rubber wood which is traded on the rejuvenation of old rubber plantations are replaced with young rubber trees. Rubber wood timber can be used as home building materials, firewood, charcoal, or sawn timber for household items. Rubber latex tapped from rubber processed into a stem in the form of crepe, smoked sit and concentrated latex. The rubber plant is growing plantation crops in different regions Indonesia. Rubber is a product of the coagulation process plant sap of rubber (latex). Normal rubber trees are tapped in the 5th year. Products from subsequent latex clumping processed to produce rubber sheet (sheet), chunks (boxes), or crumb rubber (crumb rubber) which is the raw material rubber industry. Exports of rubber from Indonesia in various form, namely in the form of industrial raw materials (sheet, crumb rubber, SIR) and the product derivatives such as tires, parts, and so on. Latek Concentrated latex is a processed product made of natural latex with a particular process. Concentration of natural latex is done by using four ways: centrifugation, pendadihan, evaporation, and elektrodekantasi. Among the four methods of centrifugation and pendadihan a way that has been developed commercially for a long time. Latex concentration by centrifugation carried out using a centrifuge speed 6000-7000 rpm. Latex is inserted into the centrifuge (separator) will experience playback of the centripetal force and centrifugal force. The centrifugal force is much more greater than the acceleration of gravity and motion brown so that separation will occur rubber particles with serum. Part serum which has a large density will be thrown to the outside (skim latex) and the rubber particles will be collected at the center of centrifuge. This concentrated latex containing 60% dry rubber, latex skimnya while still contain between 3-8% dry rubber with a density of about 1.02 g / cm 3. Concentration of latex in a way pendadihan pendadih require materials such as sodium or ammonium alginate, tragacant gum, methyl cellulose, carboxy methylcellulosa and flour iles-iles. Presence of pendadih cause the rubber particles will form chains into droplets with a diameter greater. The difference in density between the rubber grains and serum cause the rubber particles have a density less than the serum will move upwards to form a layer, while the under is serum. The quality of the resulting latex determined according to ASTM and ISO specifications. • Type I: Latex centrifuge with concentrated ammonia alone or with preservative preservative formaldehyde followed by ammonia. • Type II: pendadihan concentrated latex preserved with ammonia only or by formaldehyde followed by ammonia preservatives. • Type III: centrifuge latex preserved with low ammonia levels and secondary preservatives. Crumb rubber is dry rubber processing process through peremahan stage. The raw material is derived from the latex is processed into a coagulum and of the lump. The raw material is the most dominant lump as crumb rubber processing aims to uplift the low quality of raw materials into products of higher quality. Kompo who have suffered during the 10-15 day completion trivialized in the granulator. Peremahan aims to get the crumbs that are ready to be dried. Properties produced by peremahan is easily drained so achieved higher production capacity and perfect crumb maturity. Kompo superbly experienced peremahan then dried in the dryer for 3 hours. Entered into the dryer box 12 minutes once dryer, dryer temperature 122 ° C for raw materials Kompo and 110 ° C for WF process. The temperature of the products that come out of the dryer below 40 ° C. Drying aimed to reduce levels of water to keep it safe limit of insects and microbiological, enzymatic and hydraulic. In the drying factor used effects that can result is the length of completion, crumbs altitude, temperature and drying time. Pressing the bale-bale formation of dry rubber crumb. Material that comes out of the dryer and then weighed weighing 35kg / bale which will be packed in containers and 33,5kg SW / bale for packaging. Once the product is pressed by using the bale press machine. Pressing outcome measures 60 x 30 x 17 cm. Packaging intended to avoid absorption of moisture from the environment and free of other contaminants. Once the product is pressed, and then deposited on the aluminum table for sorting by using copiers. Once the product is wrapped with 0.03 mm thick transparent plastic and melting point of 108 ° C. Bale that had been wrapped, then put in containers with interlocking arrangement. Thus, Country earns foreign exchange of payment instruments which are indispensable for the life of the people in this global era of trades. Read other commodity as the horticulture and other in this blog. Thank you for your visit to my. Give your opinion. This article reminds us that Indonesia has a lot of potential to increase the nation's economy. all of paragraph in this article is good until reminds us that indonesia has a great potential in the field of industrial specially for Rubber Processing, but mr I found that indonesian language has written in side! example : pendadihan.. I hope with its rubber processing could be increase of state revenues. Thanks for the information sir, all of your article is very usefull.